'Epazote' is a herb sometimes used in Mexican-American and Southwestern food recipes, but which should be used with caution. Many cooks in Texas kitchens still put a sprig into a pot of beans as both flavor and with the idea that it will reduce flatulence. Another use is to slip a leaf into a tamale or taco. Epazote is a member of the goosefoot, or chenopodium family and is related to such plants as lambs' quarters (C. album or berlandieri) and various pigweeds. 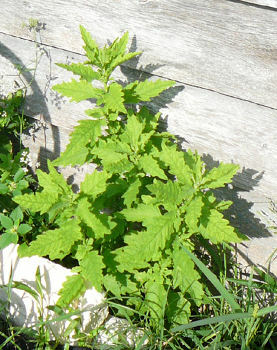 While lambs' quarters and several of the other 26 species of Chenopodium present in Texas and the Southwest are sometimes eaten for food and are considered mild in taste, epazote has a distinctly "skunky" taste, and according to some authorities received its name from the Nahuatl word "epatl", or skunk. A long-held folk idea is that the oil expressed from the seeds serves as an expeller of worms and amoebas (and epazote is considered a member of what in English are called "wormseeds") but this oil has distinct chemical effects both on worms and on the human body. There are reports in the literature that infants and small children have been poisoned by the use of the oil. A study from the University of California (J. Jimenez-Osorio, Am. J. Bot. 78:139, 1991) found that the compound ascaridole in epazote inhibits the growth of nearby plants, so it would be best to relegate this plant at a distance from other inhabitants of the herb garden. Even though this plant has an established place in recipes and in folklore, it is wise to use only the leaves, and those very sparingly, in cooking. This is a very adaptable plant and can be found almost anywhere in Texas. It is considered to be native to tropical Americas. The well known culinary expert Diana Kennedy, who wrote many cookbooks on Mexican cooking, has often been quoted as saying that it could be found almost anywhere if a person was actually looking - in the cracks of the paving in a parking lot, or in Central Park. Common names include paico macho, yerba de Santa Maria, té de las Jesuitas, té de Espana, hierba hormigero. Epazote has common names in German, French, Italian, Portuguese and even Chinese ("t'u-ching-chieh"). The plant is relatively drought-resistant and can withstand some frost. It will grow from one to 3 feet in height, and usually has soft, notched leaves and inconspicuous flowers. Its rank odor may be detected from a few feet away. It is not particular about soil, but prefers full sun.